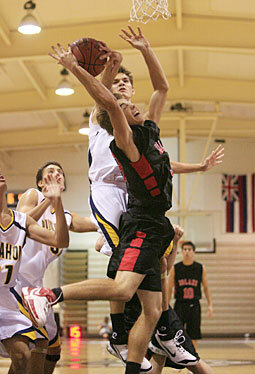 Punahou's Kameron Steinhoff, back, blocked a shot by Iolani's Brandon Ball in the Buffanblu's win over the Raiders last month. Iolani won the rematch last week and took over at No. 1. Respect and recognition are commodities in the prep basketball world. That's why traditional powerhouses and veteran coaches get the benefit of the doubt when it comes to polls. It also explains why a talented, cohesive team like Maryknoll had not gotten its due. Not until now, anyway. Maryknoll (8-4) finally cracked the Star-Bulletin Boys Basketball Top 10 today. The Spartans landed at No. 8, just days after upsetting Saint Louis 44-42. Surprised? Don't be. While Mid-Pacific drew plenty of attention in the past year, Maryknoll quietly built a foundation under Blaine Gier, who stepped down and handed the reins to former assistant Steve Hathaway. "People call our wins upsets, and I tell the boys, 'Let people call them what they want to call them.' But we're not even close to peaking yet," Hathaway said. The victory over Saint Louis made an impact. "That win was big," Hathaway said. "We've lost those kinds of games. I'm just glad they keep working hard and people are recognizing it. "I'm happy for these guys. We have 10 seniors. I got to know them as seventh graders, and then Blaine brought me up (to varsity) the past two years." The Spartans showed signs of emergence as far back as a month ago, when they rallied to upend then-ranked Mililani in overtime at the Pete Smith Classic. Maryknoll has a solid backcourt with Tyler Terai and Garrick Chock, and a go-to scorer in Richard Herring. The steady play of Ross Lum in the middle has been a big X factor for the Spartans, who give the Interscholastic League of Honolulu five of the top eight teams in the poll. Pretty good for a school that doesn't have a gym to call its own. The Spartans currently practice at the Atkinson YMCA. "I'm glad they get us the 'Y' to use (daily), but right now we split the court with the girls," Hathaway said. Plans to build an on-campus facility are finally under way. The ground has literally broken. "The gym will be up in 18 to 24 months," Hathaway said. For now, Maryknoll's focus is on today's foe, defending league champion Punahou. "That's a huge game, and them coming off a loss (to Iolani), they're gonna be hungry," he said. The Punahou-Iolani game was a defensive duel, with both teams struggling from 3-point range against 1-3-1 zones. Hathaway hopes his gunners have no hesitation about pulling the trigger. "We have a lot of shooters, we've had a couple of games where we hit eight or more 3s. I want my guys to have that mentality. Don't pass up an open shot. If we're missing, maybe we'll slow it down a little, but these guys have the freedom and they all know it," he said. "If you miss it, don't look at me. Just keep on playing." Kamehameha-Hawaii welcomed the return of injured seniors Kealoha Kramer and 6-foot-5 Russell Cackley in a 61-58 overtime win over Konawaena. The Warriors came through down the stretch, rallying from a five-point deficit. Coach Nelson Wong's squad shot 22-for-24 from the free-throw line. It was a turnaround for Kamehameha-Hawaii, which shot 7-for-19 in a narrow road win over Kohala two nights earlier. "As coaches, we talk about how free throws are mental," Wong said. "Whether we shoot poorly or not, we don't spend more or less time working on them. It's just mental."